More proof of the existence of the Master Designer comes from research conducted by Z. Jane Wang, professor of theoretical and applied mechanics at Cornell University (Gold, 2006). Centering on flying systems and fluid dynamics, Dr. Wang notes that the best way to learn about flight is by first looking at what happens naturally. Interesting. In order for the complex human mind to comprehend the principles of flight, that mind must focus on the natural order—the Creation. So mind must learn from that which, according to evolutionists, came into being and developed without any mind. Intelligence is dependent on non-intelligence. Who can believe it? Reporting her findings at the annual meeting of the American Association for the Advancement of Science, Dr. Wang observed that her research calls into question the conventional wisdom that ascribes to airplanes (human inventions) more flight efficiency than the flying creatures of the natural realm. Dragonflies, for example, are “a marvel of engineering” (Gold, 2006). “Marvel of engineering”—without an Engineer? So claims the evolutionist—despite the irrationality of such a conclusion. Indeed, the dragonfly possesses four wings, instead of the standard two, enabling it to dash forward at speeds approaching 60 kph. Its unusual pitching stroke allows this amazing insect to hover and even shift into reverse. According to Wang: “Dragonflies have a very odd stroke. It’s an up-and-down stroke instead of a back-and-forth stroke.... Dragonflies are one of the most maneuverable insects, so if they’re doing that they’re probably doing it for a reason” (Gold, 2006, emp. added). “For a reason”? But doesn’t “a reason” imply a reasonable mind behind the reason that thinks and assigns a logical rationale to specific phenomena? The more scientists study dragonflies the more they are impressed with these “marvels of flight engineering” (“How Do Things...,” n.d.). They appear to twist their wings on the downward stroke, creating a whirlwind of air that flows across the wings, facilitating the lift that keeps them flying. Even more amazing, one Australian scientist, Akiko Mizu­tani, of the Centre for Visual Science at the Australian National University, has studied dragonflies at length in the past few years. She observes that, while chasing its prey, dragonflies “shadow their enemies in complex manoeuvres that military fighter pilots can only dream of. Their tricks create the visual illusion that they’re not moving” (as quoted in “How Stealthy...,” 2003, 2398:26, emp. added). In fact, according to Dr. Javaan Chahl, the quick aerial movements allow the dragonfly to disguise itself as a motionless object (“Military Looks to Mimic...,” 2003, emp. added). These insights are not lost on the military establishment. They recognize the incredible implications for technological development—from the ability of fighter aircraft to approach the enemy undetected, to greater maneuverability, to enhanced helicopter logistics. Indeed, “scientists believe the insect’s flight control could have applications in new planes and helicopters” (2003). Is it any wonder that one of the very first helicopters produced was named “Dragonfly” (“Sikorsky...,” 2003)? If no one considers the helicopter as the product of time and chance, why would any reasonable person believe that the insect to which scientists are looking for an understanding of principles of flight evolved from mindless, mechanistic forces of nature? If the human mind, with all of its complexity and ingenious design, is necessary to engineer flight capability (e.g., airplanes), what must be said for the Mind behind the human mind? If scores of intelligent scientists must expend vast amounts of time, energy, intention, deliberation, knowledge, and thought in order to discover the secrets of the “efficient motions” of the dragonfly, what must have been required to create that dragonfly in the first place? Mindless, non-intelligent, unconscious, non-purposive “evolutionary forces”? Ridiculous! Time and chance do not and cannot account for the amazing design found in insects like the dragonfly. The only logical, plausible explanation is that dragonflies were designed by the God of the Bible, and they testify to His wisdom: “You are worthy, O Lord, to receive glory and honor and power; for You created all things, and by Your will they exist and were created” (Revelation 4:11). 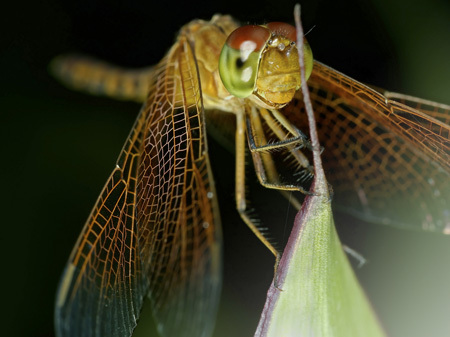 Gold, Lauren (2006), “On the Wings of Dragonflies: Flapping Insect Uses Drag to Carry its Weight, Offering Insight into Intricacies of Flight,” Cornell University Chronicle, February 19, [On-line], URL: http://www.news.cornell.edu/stories/Feb06/AAAS.dragonflies.lg.html. “How Do Things Fly?” (no date), Boeing, [On-line], URL: http://www.boeing.com/compan yoffices/aboutus/wonder_of_flight/dragon.html. “Military Looks to Mimic Dragonflies” (2003), ABC News, June 5, [On-line], URL: http://www.abc.net.au/news/newsitems/200306/s872489.htm. “How Stealthy Insects Outsmart Their Foe” (2003), New Scientist, 2398:26, June 7. “Sikorsky HO2S-1/HO3S-1G ‘Dragonfly’” (2003), USCG Homepage, [On-line], URL: http://www.uscg.mil/hq/g-cp/history/WEBAIRCRAFT/AC_Sikorsky_HO3S.html.